Marianna Popiełuszko died today (19th November 2013) at the age of 93 at the City Hospital in Białystok. She was the mother of Blessed Jerzy Popiełuszko. Marianna prayed to be the mother of a priest and when her son went to the seminary and was ordained, she supported him from afar with prayers and occasional visits. She learned from the television that her son had been kidnapped and ten days later of his death. 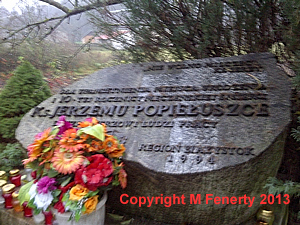 Her son Jerzy Popiełuszko was beatified in 2010. 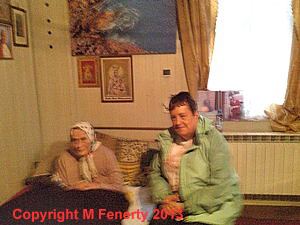 I met Marianna Popiełuszko on 26th October 2013 at her home in a small village. She sat up in bed wearing a head scarf. Father Marek Kosciołek, her son Stanisław, myself and three children we brought with us prayed the chaplet of Divine Mercy. She was asked the question why Blessed Jerzy went to the seminary in Warszawa and not Białystok. It was because Białystok seminary required the full payment each month, whereas in Warszawa, she could pay half the full payment and used to sell eggs and other farm produce to pay for his fees. 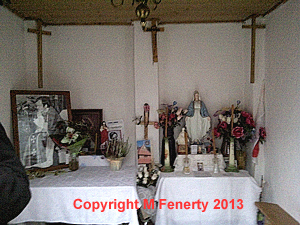 Across the road there is a small hut used as a shrine and once a year Holy Mass is said and all the villagers attend. There is a large stone outside as a memorial to her son. She will now be happy to be united to her son again.